Tens of thousands of pounds of chicken nuggets are being recalled across the US, according to the Department of Agriculture. Tyson Foods is voluntarily recalling all five-pound bags of "White Meat Panko Chicken Nuggets" that were produced on Nov. 26, 2018, according to the Department of Agriculture’s Food Safety and Inspection Service (FSIS). "A small number of consumers contacted the company to say they had found small pieces of soft, blue rubber in the nuggets, prompting the company to issue the recall," a Tyson Foods spokesperson said in a statement. "Though the pieces have been found in a very small number of packages, no injuries have been reported with this recall." "However, out of an abundance of caution, the company is recalling 36,420 pounds of product," the spokesperson said. FSIS said it first became aware of the problem on Tuesday. Authorities are now urging people to double check if they've purchased the nuggets. "FSIS is concerned that some product may be frozen and in consumers’ freezers," the USDA officials said. "Consumers who have purchased these products are urged not to consume them. These products should be thrown away or returned to the place of purchase." 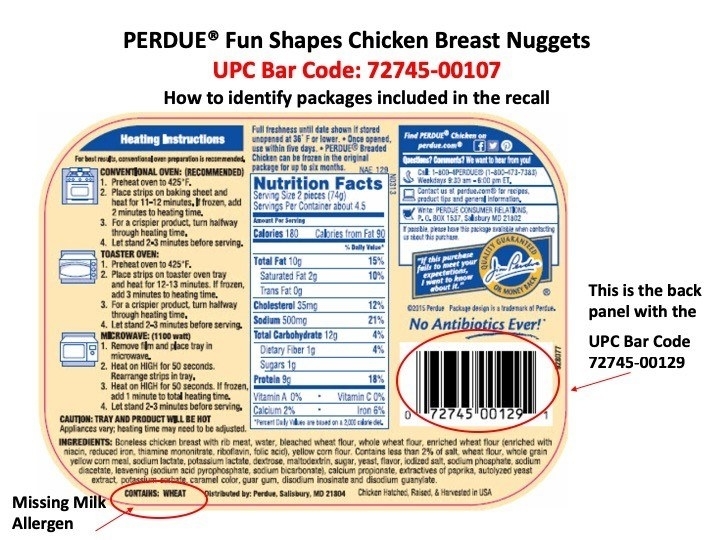 FSIS said Perdue's "Fun Shapes Chicken Breast Nuggets" contained milk, a known allergen, and this was not declared on the product label. Authorities said they hadn't received any reports of illness from the product, but urged anyone concerned about their health to seek medical attention. 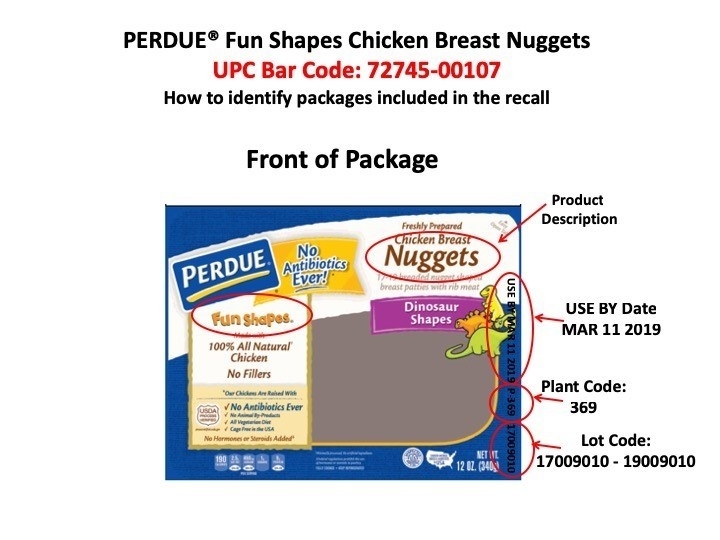 “After receiving a customer inquiry, we conducted a comprehensive investigation and have isolated this to an error during a specific time frame of the production run of Perdue Fun Shapes Refrigerated Chicken Breast Nuggets,” Jeff Shaw, the company's vice president for quality assurance, said in a statement. “Out of an abundance of caution for our consumers we have decided to recall these items that were sold in the refrigerated case," he said.